Review: Yaleesa Hall returns to his Will & Ink imprint with some fascinating techno derivatives on the Hayley Laura EP, although these are much more straight ahead than his usual stripped down experiments - best heard on his 2016 debut album. Beginning with the electro-bass assault of "Zoe Price" bringing that UK style sound popularised by Carl Finlow or Radioactive Man in true style. 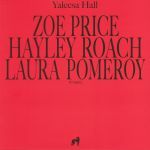 "Hayley Roach" with its splintered beats and and tunnelling sequences are reminiscent of Regis' output in the late '90s, while "Laura Pomeroy" being the the most atmospheric cut on offer here - going down a more lush and hypnotic route. This is the first solo output from the Amsterdam based producer on the label.